If you are looking for the modern RuneScape guide for this content, please see our The Restless Ghost guide. 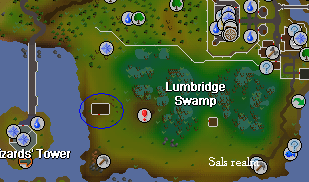 Speak with Father Aereck in the Lumbridge Church. Firstly, talk to Father Aereck and ask him if he has a quest for you. 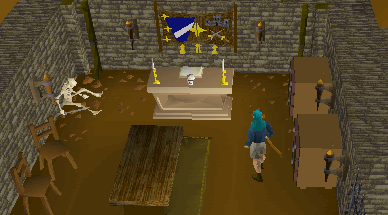 He can be found inside the Lumbridge church, standing around the altar. He says that he needs someone to make the ghost in the church graveyard go away. He mentions that his friend Father Urhney may be able to help you. Leave the church and follow the road north until you reach the General Store, and then head west along the dirt path until it ends. Now head southeast through the swamp, or head south along the ocean until you find a small house. Talk to Father Urhney and tell him that Father Aereck sent you. Say that a ghost is haunting the graveyard, and he gives you an Amulet of GhostSpeak so that you can talk to it. 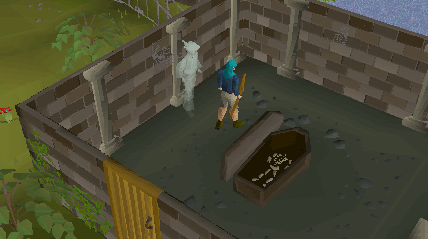 Go back to the church in Lumbridge and walk into the graveyard behind it. The ghost is inside the small building in the corner of the graveyard, and you may need to open and close the Coffin to get him to appear. With your new amulet on, speak to the ghost, and when he asks if you understood him, tell him that you did. He says that a warlock has stolen his skull, and that may be why he can't rest. Now leave the graveyard and follow the road north until you reach the General Store. Head west along the same dirt path you traveled before, but this time keep to the same direction until you reach a road. Follow it south into the Wizard's Tower, and climb down the ladder. Walk along the corridor to the door on the east side. You'll see an altar; search this to find a Skull. A level 13 Skeleton will then jump out at you, but since you already have the skull, just run away! Visit the ghost back in the graveyard, and tell him that you've found his skull. He needs you to put it in his coffin, and after you do so he will be able to rest. 125 Prayer experience You may keep the Ghostspeak Amulet from the quest. Another may always be obtained from Father Urhney if you lose yours.